The Riley State Bank of Riley, Kansas is an independently owned financial institution that has been serving the community in northern Riley County since 1943. Located at 201 South Broadway in downtown Riley and at 106 South Erpelding in Leonardvile, we offer a wide variety of deposit and loan products, safe deposit boxes and many other products and services. On July 1, 2010 we acquired the Farmers & Merchants State Bank of Wakefield which has been serving its community since 1908. Those facilities are located at 711 Elm Street in Wakefield and at 119 Weda in Longford. We have ATM’s located in Leonardville, Randolph, Riley and Wakefield. We are a member of the SHAZAM ATM/Debit Card Network which is accepted all over the world. We take pride in making all decisions internally and maintaining a personal and friendly banking relationship with our customers. When you bank with us you are investing in your community. © . 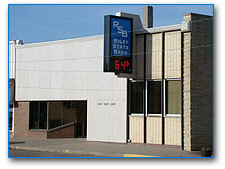 The Riley State Bank of Riley. All rights reserved.